You can upload some of your albums to the web. Go to Picasa Web, get an invitation for the limited beta, download the new version of Picasa (even if you already have Picasa, you need to upgrade). When you right-clik an album, you'll see a new option: "Upload to web album". You have a space limit of 250 Mb and you can make a web album public or private. For $25 a year, you can have 6GB extra storage space and no bandwidth limits. For an album, you can specify a name, a description and a cover album. You can add captions by clicking "Add Caption" while viewing individual photos. You can also use Picasa Web Albums without installing Picasa using a basic uploader or a more fancy ActiveX control that allows you to upload more pictures at once (Internet Explorer). To do that, visit Picasa Web and click "New Album" or select the album you want to upload photos. Click "Upload Photos" on the left side of the page. By default, the URL of your public web album is based on your Gmail username, but you can change that in your settings. 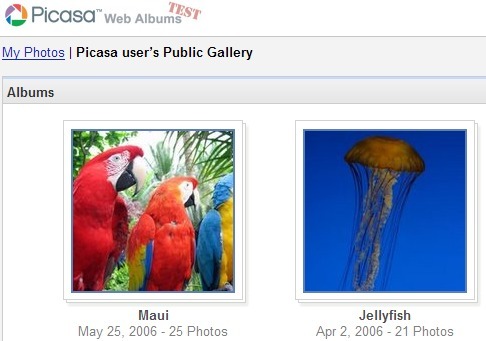 You can also download other users' public albums to Picasa, so this is a great way to share photos. Unfortunately, it's very hard to organize large albums on the web. There is no search option, you can't assign tags and there is no way you can synchronize an album from Picasa to a web album. To view a gallery of screenshots from Picasa Web, go to my Picasa album. Can somebody invite me to the picasa webalbums? Just enter your Gmail username at picasaweb.google.com. There is a good chance you'll get the invitation instantly. Sad to say invites are no longer instant. Wonder how long I'll have to wait. Thanks for posting the direct link to the new version of Picasa. any idea how long i should wait to receive an invintation ? You have some beatiful photos. I am leaving my link to my photo gallery for you. Great photography! I want a Picasa Web Album for my photography too~. Mind if you invite me or somebody?? Just go to picasaweb.google.com. You don't need an invitation anymore. I cannot view my pics on the web as it says No standard web pages containing you words was found, when I have actually uploaded pics and created the album online. Picasa 3 just updated itself over my picasa 2...THAT#*$&%^$!! !My computer doesn't like the Pic 3, and MONE OF THE OPTIONS FOR DOWNLOADING A SINGLE PHOTO WORLK!!!!!!!!!!!!!!!!!!!!! !I can't even begin to tell anyone just how angry I am!!!!!!!!!!!!!!!!!!!!! !How can I get rid of Pic 3 and get Pic 2 back?????? ?